Welcome to the Roxtons Varzuga Blog. From mid May until the end of June we will try and post daily blogs to keep you updated on fishing conditions and news from this amazing salmon fishery. We hope you enjoy the blog and look forward to seeing you on the Varzuga. 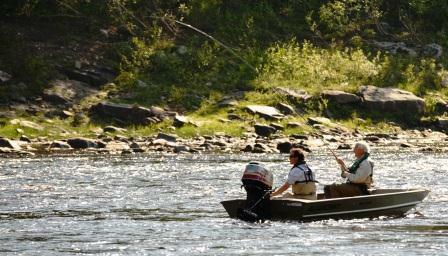 Hugh and I joined Peter J and Olivier D on Simmons where some fish were showing in the streamy runs opposite Eagle Rock. With the water temperature by mid-afternoon at a highly challenging 20⁰C we changed Peter to a tiny skating fly and Hugh took him out in a boat to cover the better lies where the wading is quite tricky. I took Olivier further up and we had an interesting wade (Bambi on ice springs to mind) through the fast water which really was our only hope of a fish. Peter soon hooked a fish on his skater but sadly it dropped off close to the net. We moved a few more but they really were not at all aggressive and there was little to do but call it quits at 6 p.m. and retire for an ice cool beer. Further up the river in the Yovas rapids the fishing was better and the majority of our 32 salmon for the day came from up there. Ian S described the canyon as “pure wilderness – pure heaven”. 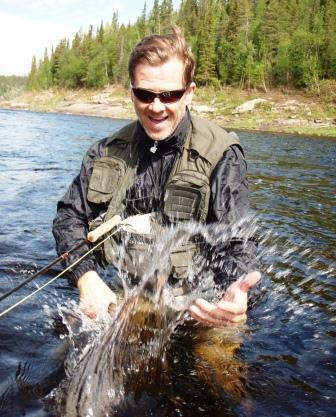 Top rod for the day was Rodolphe C with a very creditable 8 salmon. Pana was difficult to hear on the radio last night and some rods were still out, Damian thought they would be around 25 for the day, in the hot weather most had not undertaken much walking, reserving their energy for the hoped for change of weather. There were however whoops of delight from Tom at Kitza when he realized they were by far the top camp. His younger rods had walked up to Boat Pool and fished back down while the more senior guests fished closer to camp and down to the Piddling Pool. Fish were taken throughout the river with Ian B landing a beauty of 16lbs from Old Dam. The water temperature never rose above 17⁰C and they were all delighted to put 45 salmon in the book. I can visualize the large grins (gins? Ed) over there as they celebrated out fishing Middle, and with 4 less rods – well done Kitza! There is nothing quite like a challenge to keen fishers and our team here were off by 08:45 this morning. I have given up looking at the forecast, a complete waste of time. A glance out of the window tells me it is sunny and warm with a hint of high cloud that might indicate a front coming in – on second thoughts that might be significant so I’d better check on my computer. From mid May until the end of June we will try and post daily blogs to keep you updated on fishing conditions and news from this amazing salmon fishery. We hope you enjoy the blog and look forward to seeing you on the Varzuga.